A swimming pool can offer a great way to splash the hot summer days away while beating the heat in the cool water. It can also be an open invitation for friends to show up on weekends to barbeque while the children jump in the water. But a pool can also be a big responsibility. 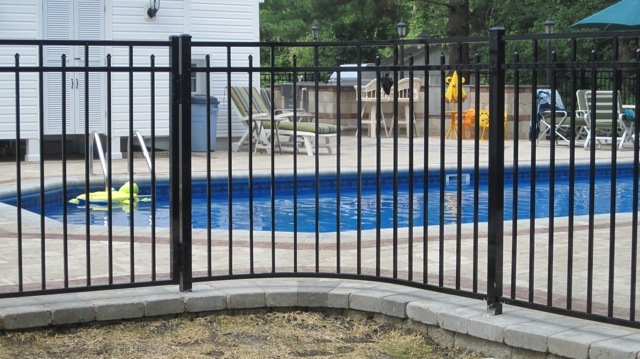 Here are the top three reasons to secure your backyard swimming area with pool fencing. Classically designed pool fences can enhance your backyard in several ways. The fencing materials can be found in designer aluminum, wrought iron, and even the modern look of mesh. Besides preventing unwanted tragedies, the fence you choose to surround your pool can make a statement about your yard. Whether it is a bold red, a powder blue, or a traditional black, the design can provide a low visual impact, or it can make a bold announcement to the world. Pool owners often admit that pool fencing can provide peace of mind when the water is unattended. By locking the gate, the water can quickly become secure, and accidents can be averted. The lock can also offer a barrier against uninvited guests when no one is home. Additionally, safety fences can be especially valuable to parents of small children. The peace of mind that comes with a secure lock cannot be overstated. Because of complicated legal actions regarding pools, many municipalities have established laws requiring swimming pool fences for anyone having a swimming area on his or her property. To protect yourself and your family, check the codes, regulations, and laws regarding fencing for pools in your area. If relaxing with friends around the pool on those hot summer days is your idea of fun, a fence can add to your peace of mind during your down-time by limiting access to swimming waters. Pool fencing can be one of the best ways of ensuring your family and friends have a safe summer experience.